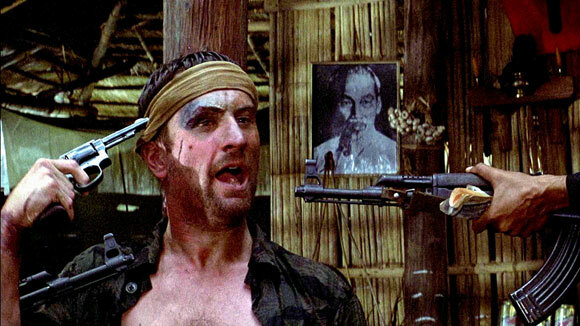 A critical and financial success, Michael Cimino’s The Deer Hunter remains a curious Hollywood “classic”. Adored by its fans, despised by its detractors, the film polarises opinion. 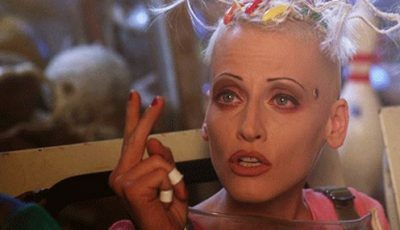 Mark Fraser takes an in-depth look at this fascinating piece of cinema. 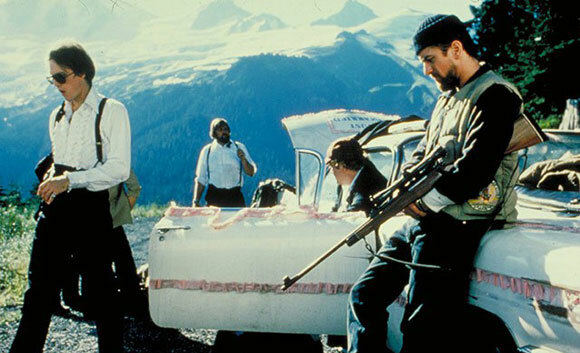 When The Deer Hunter was initially released in December 1978, it received a warm reception – one which ultimately helped it become the year’s big Oscar winner. Yet despite all its critical and financial success, the film also had its fair share of detractors. Today it has emerged as one of the most polarising Hollywood movies from the late 1970s. Mark Fraser revisits a dubious American classic. All the so-called great cinematic works manage, in some way, to withstand the test of time. Michael Cimino’s portentous The Deer Hunter isn’t one of them although, in a few departments, it does come kind of close. While it won five Academy Awards in 1979, including the coveted best picture and director gongs, the movie is now ostensibly more curio than masterpiece – a throwback to a bygone era when audiences were perhaps a little more forgiving of suspect subject matter parading as serious social commentary. 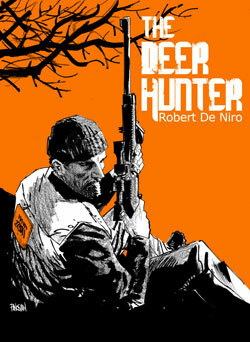 At its heart The Deer Hunter is a poetically ambitious, albeit significantly flawed, treatise on the horrors of war (in this case Vietnam circa the late 1960s until the fall of Saigon in 1975) and how it impacts the lives of those who are, either directly or indirectly, touched by it. The film, however, is driven by a strange naive sensibility that initially saw charges of racism, sexism, misogyny and serious historical distortion brought against it by some prominent members of the American movie reviewing community. Furthermore, it managed to irk a few others (such as the Russians, whose communist authorities deemed it a “scandalous, racist and militarist” work) for pretty much the same reasons. One of the movie’s early detractors was the father of American auteur criticism, Andrew Sarris, who maintained the film could not claim legitimate “art” status as its scenes of Russian roulette being forced upon hapless US prisoners of war by their North Vietnamese captors simply didn’t happen. 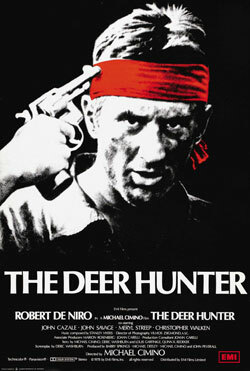 During a 1979 radio interview on New York’s WBAI-FM, Sarris defended his position by highlighting the fact The Deer Hunter’s narrative raised two questions which were “very difficult to resolve”. While it won five Academy Awards in 1979, including the coveted best picture and director gongs, the movie is now ostensibly more curio than masterpiece – a throwback to a bygone era when audiences were perhaps a little more forgiving of suspect subject matter parading as serious social commentary. 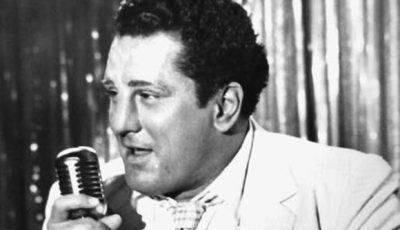 When Sarris initially reviewed the movie in December 1978, he accused it of “operatic inarticulateness” and pushing “a particularly devious expression of homosexual panic”. Furthermore, he castigated the film for “failing to be convincing on the psychological, sociological, or historical surfaces of its narrative”, suggesting the only thing its claim to legitimacy could fall on was Cimino’s “personal mythology”. “Once more, the outline for a great film has been mistaken for the actual achievement of the film itself,” Sarris remarked. Another reviewer who didn’t quite have the Village Voice critic’s stature at the time – but has since gone on to become one of the great writers about (and chroniclers of) modern American cinema – also took an immediate dislike to the movie, calling it “distressing” and “a lie from beginning to end”. 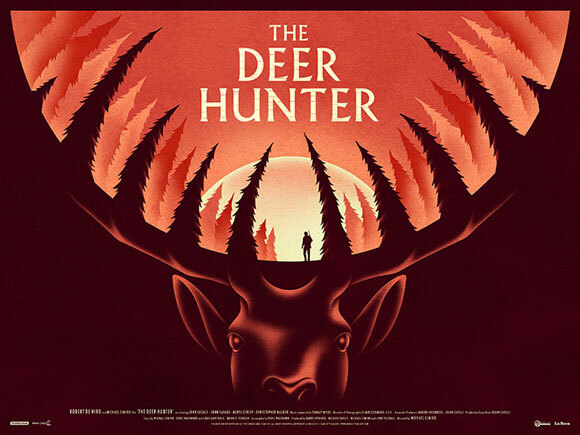 Not surprisingly The Deer Hunter also had its supporters, including a number of well-known American critics who seemed okay with ignoring some of the movie’s historic and dramatic misdemeanours. 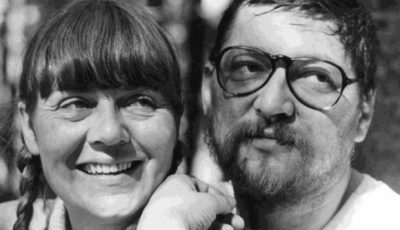 Roger Ebert, for example, was sympathetic, describing it as “a heart breakingly effective fictional machine that evokes the agony of the Vietnam time”. “It is not an anti-war film. It is not a pro-war film. It is one of the most emotionally shattering films ever made,” he wrote. Meanwhile Sarris’ bete noir – The New Yorker’s eclectic Pauline Kael – surprisingly called The Deer Hunter an “astonishing work” and “a remarkably full screen treatment of the mystic bond of male comradeship”. However, her review also accused it of being “a romantic adolescent-boy’s view of friendship” that attempted to move people by “pandering to their prejudices”. Even Vincent Canby of The New York Times – the critic who later helped decimate Cimino’s career with his absolutely scathing review of the filmmaker’s US$40 million-plus follow-up project Heaven’s Gate in late 1980 – found himself praising the auteur for trying to create a work which was “nothing less than an appraisal of American life in the second half of the 20th century”; this despite some misgivings that the movie’s point-of-view was limited and its narrative sometimes sketchy. When looking at the film’s band of supporters, it’s also interesting to reflect upon the response of the lessor known Stephen Saban. Writing for the The Soho Weekly News, this observant scribe concluded his analysis of a work which he considered an “ambitious and rewarding achievement (that was) elegant, eloquent and surprisingly subtle” with a rather stunning endorsement. “It is possibly one of the best films ever made,” he gushed. An intriguing aspect regarding this early critical response to The Deer Hunter is the fact that pretty much all of the reviewers who came to the movie’s defence did so with a caveat in place. 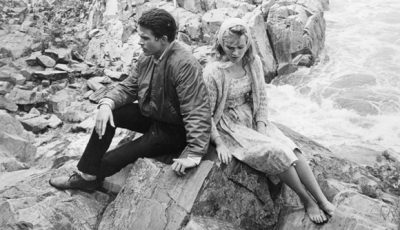 Their common dialogue went something along the lines of: Yes – the film is fatally flawed, but it’s beautifully made; yes – it is manipulative, but it’s also very moving; yes – it fabricates history to enhance melodramatic poke, however, it does attempt to deal with important contemporary issues; yes – it is about the complexities of the adult world, but it’s also juvenile; yes – the script is a bit dodgy, but it is so well acted; and yes – it does seem to be slightly gay, but that’s only in a sub-textual kind of way. Bearing all this in mind, it’s arguable there are a few fundamental reasons why The Deer Hunter is now more dubious classic than misunderstood masterpiece. Firstly, it is, as Sarris suggested when he spoke to the Cineaste editors, a piece of fascist art; an undeniable exercise in truth-distorting propaganda where the complexities of the world are ultimately bundled into a simplified and easily digestible black and white Trinity – the Good, the Necessary and the Evil. In this instance the Good comes in the form of a bunch of fun loving boys from a close knit, blue collar, salt-of-the-Earth, traditional Eastern European-American community somewhere in Pennsylvania, who work the night shift at the local steel mill, spend their mornings drinking beer and playing pool at a friend’s bar before, presumably, finding some time during the rest of the day to sleep it all off. Their leader, the stoic Michael Vronsky* (Robert De Niro), is the most focused – whether he is on the job, on the road (where he is always the driver, drunk or not), on the deer hunt or, eventually, in battle. His best friend and trailer mate is Nick Chebotarevich (Christopher Walken), a compulsive petty gambler who can’t resist making a bet, be it when they are racing the cab of an uncoupled freight truck down the main street of the steel town of Clairton in Vronsky’s Coupe de Ville, or just winding down and shooting pool in Welsh’s Lounge as Frankie Valli’s Can’t Take My Eyes Off You blares out of the jukebox. In the end it’s this penchant for gambling which ultimately leads Chebotarevich to his demise after he goes AWOL in the backstreets of Saigon. The entourage’s sensitive kid brother is Steve Pushkov (John Savage), a man whose emotional vulnerability first surfaces when he is hen-pecked in the bar by his ethnic mother (Shirley Stoler) for not being at home and getting ready for his imminent wedding to the pregnant Angela (Rutanya Alda) later that day. Like the stronger Michael, the sensitive Pushkov seems to have a strong personal moral compass, choosing to marry his girlfriend despite knowing her child isn’t his. 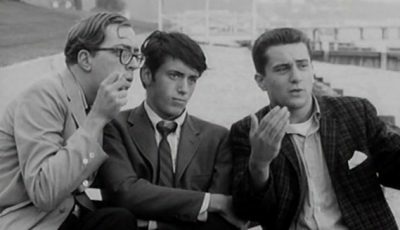 It’s shortly after the wedding (which takes up a significant portion of the film’s first act) that this trio of friends head off to Vietnam. Staying behind are Stan (John Cazale), a bickering and somewhat narcissist sleazebag who has a tendency to punch women during moments of jealous rage; John Welsh (George Dzundza), the jolly corpulent owner of the local watering hole who not only turns up in the church choir at the wedding, but can also punch out a classical tune on the piano (in this instance Frederic Chopin’s sixth Nocturne in G-minor); and the burley Peter “Axel” Axelrod (Chuck Aspegren), who’s main purpose is being the big easy going bloke with a beard. If anyone in this crew looks like a Pennsylvanian steel worker, it’s Axel. On the periphery (as are all the women in the movie) is Nick’s girlfriend Linda (Meryl Streep), who works at the local supermarket and – at the start of the film – flees from her drunkenly violent father (Richard Cuss) by taking on trailer-minding duties for Nick and Michael while they are in Vietnam. 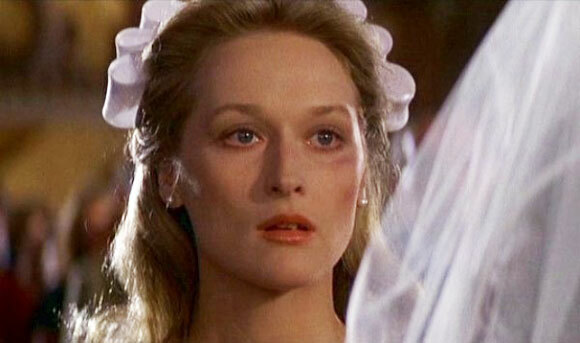 At the end of the day she is the closest thing The Deer Hunter has to a leading lady. Meanwhile, the second part of this Trinity – the Necessary – manifests itself through the dismantling of this central group of pals via the rituals of marriage and the call of battle. Finally there’s the Evil which, in this case, is personified by the barbaric Vietnamese – a people so brutal and bloodthirsty that their country’s national sport seems to be Russian roulette. Within this framework Cimino establishes a rather tenuous scenario where simplistic convenience and unashamed audience manipulation are dramatic norms; a world where the complexities of history are sacrificed in pursuit of a cleaner, mythologised and more ethnically pure version of the past. Under these rules this team of isolated, happily content beer swilling buddies is somehow exempt – presumably because of its Eastern European extraction – from being called a bunch of rednecks, despite the fact its leader and his chief sidekick are literally nothing more than well-groomed trailer trash whose diet appears to be KFC by the box full and gallons of Rolling Rock beer. Sure, they are not the leering, ignorant, backwater, hillbilly sodomites who reside in Deliverance country, but their world view, before the advent of Vietnam at least, seems to be almost as limited. In this regard Cimino has simply replaced Duelling Banjos with Cavatina. This event has all the trappings of a traditional ceremony which is fit not just for a steelworker and his pregnant girlfriend, but also a tsar. From the surrounding grandiose Neo-Byzantine architecture and the large choir at the back of the building to the pompous ornateness of the church’s interior and the painfully drawn out marriage rituals, no expense is spared when it comes to the exchanging of nuptials in Clairton, a place so grey and grimy that it’s almost impossible not to see a blast furnace and its associated infrastructure on the horizon when looking across any of the town’s streets. Cimino’s attempt to make his point – that part of the richness of this ethnic community lies with the strong spiritual connections and traditions it enjoys (and which are consequently undermined by war) – is circumvented by his tendency to exaggerate and fabricate. It may not be a lie a la Biskind, but these big picture pretensions are definitely major embellishments. Then there are the Vietnam sequences. Anyone familiar with the history of The Deer Hunter will know much has already been said about the fact that American prisoners of war were not subjected to Russian roulette by their North Vietnamese captors. Yes – they were starved, beaten, chained up in cages and huts, summarily executed and had their legs broken if they tried to escape, but the whole gun-to-the-head thing, as pushed by Cimino and his scriptwriter Deric Washburn, take things just a bit too far. In a strange way it’s sort of ironic that by using the Russian roulette metaphor to emphasise the horrors of war, Cimino pretty much trivialises one of the most important military conflicts of the 20th Century – Vietnam – an event so momentous in terms of loss of life and deleterious legacy issues that it seems criminal to use it as a melodramatic convenience in the way the director eventually does. Indeed, it is all so fanciful that it not only abrogates the film’s claim to be a legitimate statement about the Vietnam War (if indeed this was its real intention in the first place), but completely removes it from the other movies concerning this conflict which were released around the same time – namely Ted Post’s Go Tell the Spartans, Hal Ashby’s Coming Home (both 1978) and Francis Coppola’s Apocalypse Now (1979) – by placing it in the same alternative universe territory as Quentin Tarantino’s 2009 World War II pseudo-comedy Inglourious Basterds. Another annoying aspect of The Deer Hunter’s truncated Vietnamese drama is Cimino’s approach to timeline. The first part of the story is meant to take place in the late 1960s, yet the fall of Saigon – which conveniently provides the dramatic backdrop for Michael’s return to the ravaged South East Asian country so he can rescue Nick (who has become a junkie) – was in 1975. Is the director really expecting his audience to believe that Chebotarevich could survive the odds of playing professional Russian roulette in a heroin-induced haze for over half a decade? Again this is bit of a stretch. 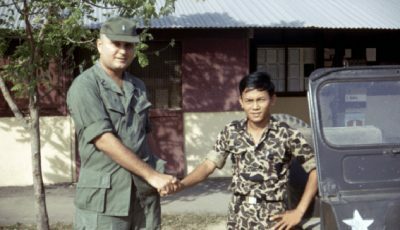 After all, according to fellow Oscar winning Hollywood filmmaker (and actual Vietnam veteran) Oliver Stone, by the time the conflict was over the US had dropped more bombs on the South East Asian nation, over 2 million tonnes of ordnance, than had been dispatched by everyone else throughout all of the previous wars in history. Significantly, this was three times as many explosives that were dropped by all sides during World War II. Furthermore, some 19 million gallons of herbicide had poisoned the country’s environment. In addition, it resulted in the deaths of up to 3.8 million Vietnamese and 58,000 Americans. Put together, these statistics indicate a far-reaching tragedy of epic proportions. Yet in Cimino’s world this conflict is something of a contrivance – an almost fictional event in which boys-own antics ride roughshod over any broader political concerns the war might otherwise have raised. Interestingly, there were some critics who were quite comfortable with this form of historical deceit and the so-called de-politicisation of the movie’s subject matter. Writing for the British publication Sight and Sound, for instance, John Pym said the film’s strength as an American populist movie derived largely from the success with which the director used a single image to “represent the post war consensus” about the country’s involvement in the conflict, that being “… the spectre of an American soldier putting a bullet in his brains, at first under compulsion and then voluntarily, for – at base – the sake of his country’s honour”. Not surprisingly, left leaning scribes like Pat Kincaid of the Workers Vanguard – a New York-based “Marxist working class” (read Trotskyite) bi-weekly publication produced by the Spartacist League – were not so forgiving. Like Biskind, who said Cimino was “little better than the Nazi apologists who deny the Holocaust ever happened”, Kincaid accused the filmmaker of frontally assaulting the truth with a “fascistic political colouration” that “manipulated feelings, not ideas”. Putting aside any serious historical or political misgivings one might have about The Deer Hunter, it remains a reasonably bold and beautiful-looking work, being both a triumph in lighting and set design. Also, despite the script’s muddle-headedness and one dimensional nature of its characters, all of the nuance-driven performances of its leads (De Niro, Streep, Walken, Savage and Cazale in particular) are pretty damn good. It may well be the latter, judging by some of the comments emanating from the press during its 2014 UK re-release. For Peter Bradshaw of The Guardian – who hadn’t seen the film since 1978 – The Deer Hunter remained a “bold and brilliant Vietnam war epic” in which the “combination of sulphurous anti-war imagery, disillusion and patriotic melancholy is even more striking”. “The idea of sacrifice permeates everything, along with the cruelty and horror,” he wrote. Meanwhile, Ryan Gilbey in New Statesman made an interesting observation when he noted there was so much “generous and understated” in the picture – including its mise-en-scene as established by Cimino and cameraman Zsigmond. “The film is alert to incongruous details, whether humorous (the giggling maids of honour flailing around in the grey streets) or tragic (Linda at the wedding, decked out in her glad rags with a bruise on her cheek),” he said. To be fair, these are still pertinent points. Putting aside any serious historical or political misgivings one might have about The Deer Hunter, it remains a reasonably bold and beautiful-looking work, being both a triumph in lighting (it’s a shame Zsigmond was up against Nestor Almendros and the exquisitely shot Days of Heaven when it came to the 1978 cinematography Oscar, otherwise he probably would have won it) and set design (the non-nominated art directors were Ron Hobbs and Kim Swados). Also, despite the script’s muddle-headedness and one dimensional nature of its characters, all of the nuance-driven performances of its leads (De Niro, Streep, Walken, Savage and Cazale in particular) are pretty damn good. Nevertheless, and regardless of its sweeping ambitions or tragic pretensions, The Deer Hunter must ultimately be recognised for what it truly is – an adult fairy tale; one in which historical integrity is sacrificed in the pursuit of overblown profundity and simplistic melodrama. *None of the lead characters in the movie are given family names in the film’s closing credits. Mike’s surname, however, is printed on the nametag attached to his uniform after he returns from Vietnam, while Nick’s is revealed when a doctor in a Saigon hospital (Tom Becker) asks him if Chebotarevich is Russian (and, in what is possibly the film’s best line of dialogue, Nick bitterly replies it is American). John, of course, is the owner of Welsh’s Lounge, so that explains his name. Not being too observant I couldn’t find any clues for the others, although I suspect the very-Russian sounding family name for Steve – which I found on Wikipedia – came from ER Corder, who wrote the movie’s novelisation. **Another consideration – many years ago an American friend of mine who spent some time in the US military during the 1970s (but never saw combat) steadfastly maintained there was no way Mike, as a former green beret, would ever have let his beard grow back after returning from Vietnam. ***While I haven’t seen the colour corrected Criterion Collection print of Heaven’s Gate, judging from the last DVD version I saw of the movie it’s still going to take a lot more to get it into proper shape. In this regard I would recommend anyone interested to track down the Mary Ann Bernard edit of the film that appeared on Steven Soderbergh’s Extension765 website. Aside from cutting out some of the more extraneous stuff, she also puts the college graduation scene at the very end as a kind of coda. It’s a surprisingly effective move – one that makes a lot of sense. Who Is The UK’s Favourite Superhero? I’ve always found it difficult to watch but I guess that’s the point of it all. For me, the performances make it work – Walken’s is truly heartbreaking. 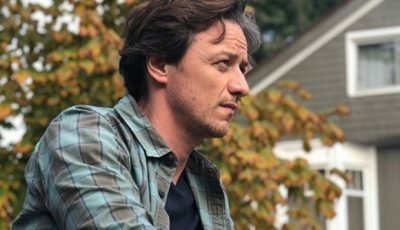 I’ve never had a problem with the backseat taken by the female cast – is this an early example of contemporary cinema’s “bromance”? A genuine classic in my mind. Debilitating, harrowing, painfully uncompromising, beautifully shot and expertly acted. There aren’t many films that can truly capture the horrors of war for audiences who are otherwise totally distant from conflict. It isn’t always about a battle-strewn war zone and bullets back and forth. Sometimes it’s as raw and simple as putting a gun to your head and pulling the trigger. Brilliant piece of writing though Mark. Incredible essay looking all over the Oscar-winning picture. Really interesting article. The Deer Hunter is an incredible piece of art; a war movie that takes the madness and makes it tangible enough to touch. I’m absolutely gobsmacked that the Deer Hunter is being evaluated through a prism of political bias. There are people out there who have an aggressive and bizarre intolerance for any war film that in which Americans are not portrayed as nihilistic, self hating, barbarians. i wouldn’t presume to defend the Russian Roulette scene simply because its greatness speaks for itself. With an indispensable performance by DeNiro that borders on being a force of nature , Cimino crafts a harrowing scene that evokes some of the strongest visceral reactions I’ve ever experienced in a film. Whether or not the Vietcong ever forced prisoners to play that game is immaterial REPEAT IMMATERIAL. The Deer Hunter has been excoriated by people with a political ax to grind and that makes for completely invalid film criticism. Racist, xenophobic, homophobic..all these jackets that just do not fit. Yes, the antagonists are not white, but the setting of the scene is in VIETNAM. So it would stand to figure their Vietcong captors would be of the Southeast Asian persuasion right? Yes they are sadists, but if the intent of Cimino was to portray all Vietnamese as such there would be a problem. But it doesn’t, so there isn’t. The scene depicts our captured protagonist American (and South Vietnamese for that matter) soldiers captured, in the middle of friggin nowhere, being pushed to the limit psychologically and physically, and trying to outthink their captors to stay alive. It’s uncompromising and truly epic filmmaking. It’s about the characters, not racial identity or political crap. This isn’t a documentary either. Vietnam was a savage experience and neither side had a monopoly on acts of barbarity and wanton cruelty. Our POWs were subjected to mind boggling torture at the hands of our then enemy. To think something like this scene occurring is outside the realm of possibility is, at best, naive. 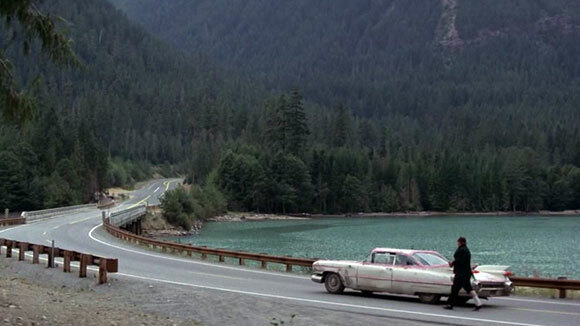 The Deer Hunter is not a perfect film by any stretch. I find many aspects of the story and narrative to be problematic. But to watch this scene expecting a to see history lesson is just imbecilic. If you can’t see through your own racial obsession and political biases, go outside and get some air. The is cinema, pure filmmaking…it must only be appreciated as such. @1138prefixTHX: I think any movie which peddles so many distortions and is predominantly fraudulent on a number of levels – be it dramatic or historical – deserves to put under a microscope of some sort. I agree that the film’s Vietnam segment is powerful when isolated from any of the gripes expressed in the review; I also agree it boasts great performance by De Niro, Walken and Savage; also, I don’t think I’m imbecilic enough to be disappointed that the film doesn’t pretend to be a history lesson. 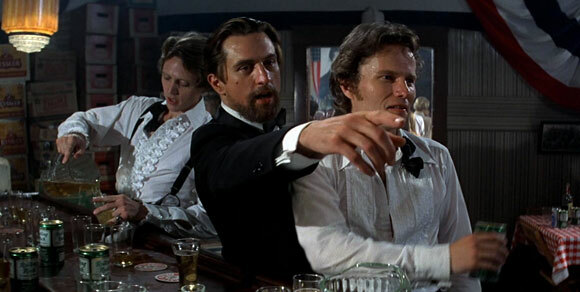 But even if one chooses to ignore the racist, xenophobic and gay subtexts which appear throughout the movie, there are still a couple of things that are difficult to deny about The Deer Hunter – namely it is quite disingenuous, while its bogus pomposity gives it an undeserved sense of self-importance. As for any accusation that it is racist, Cimino may not have portrayed all Vietnamese as sadists, but in his world, when they aren’t being sadists, they are either faceless oriental victims, blood thirsty gamblers or whores. Don’t want to sound too sensitive or PC nazi here, but I’m not fully convinced that such an undignified portrayal of any ethnic group should be allowed to come under the auspice of pure filmmaking – rather, it’s more like a touch of propaganda. Thanks for reading.